This beautiful boutique hotel offers style and comfort in the heart of Athens. Housed in a distinctive building, the hotel features elegant urban interior design with luxuriously appointed accommodations and delightful culinary experiences. 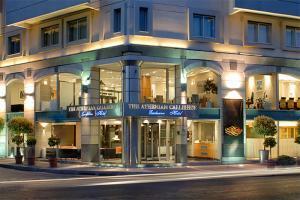 The hotel is a short walk from the city's cultural highlights including Plaka and the Acropolis. Located just 35 minutes from the Athens International airport.